There are all kinds of garage doors out there. There are Craftsman garage doors, aluminum overhead doors, roll up and one-piece doors, insulated doors and many more styles, types, brands, and designs. Choosing the right one is almost as hard as installing it. With us, you get exceptional garage door installation Humble services but also the full support from our staff when you are trying to select the new product. 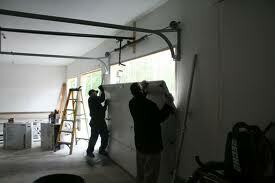 At Garage Door Repair Humble, we sell and install all types of doors. Whatever you want and need, we offer. But the secret of keeping and enjoying the convenience of your new door is finding the right one to start with. Qualified and updated, our staff can be of assistance. All doors we provide are branded and made of durable materials. What we do is help you find the right one for your garage and install it to ensure its good performance. Whether you get an aluminum garage door or a blend of glass & aluminum, our techs will install it right. Irrespective of the door’s material or size, we can do our job right. But we take such variables into account when we help you choose a new opener. And once we install the new door, we also make sure the opener adjustments are all done correctly so that the door will open and close all the way. Trust any new garage door installation to our team. Whatever you select, we can install. Give us a call if you are interested in garage door installation in Humble. Our pro will come to offer an estimate and solutions.